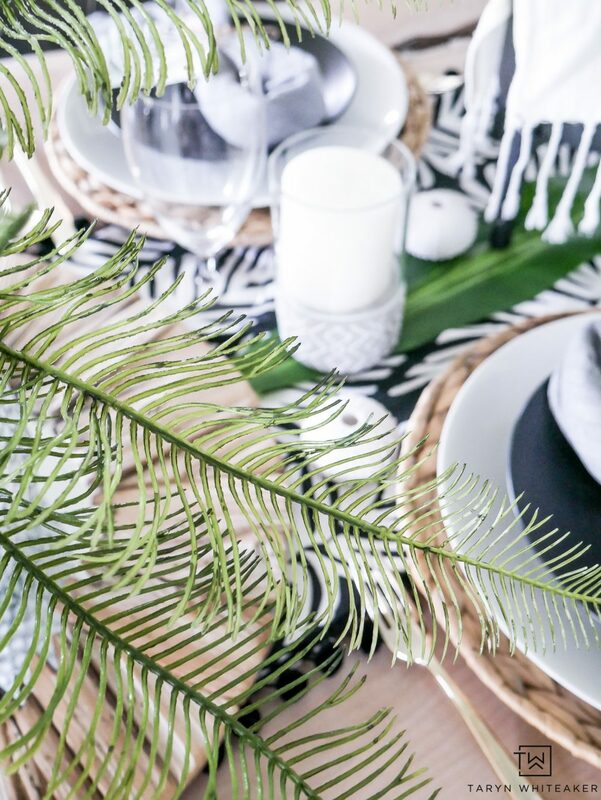 There are so many great summer decor trends happening this year, from modern lines to oversized tropical greens and throw in some coastal vibes. 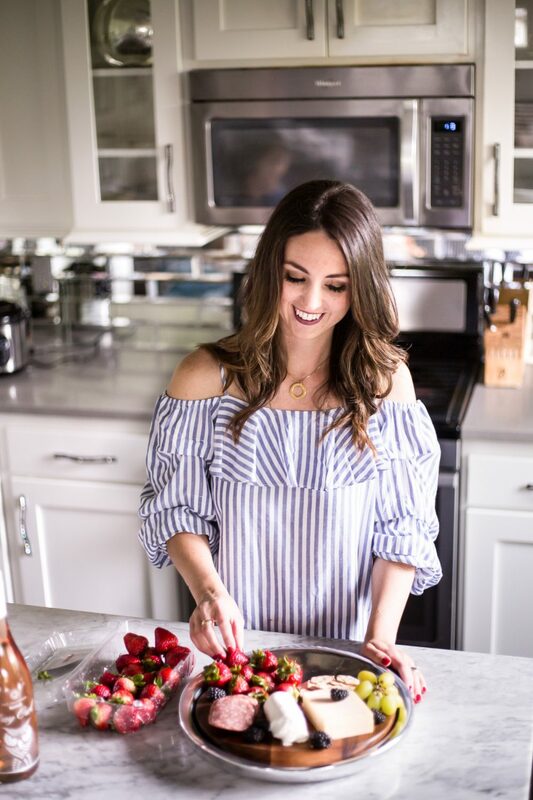 All things that I love and happen to fit right in with my personal style! 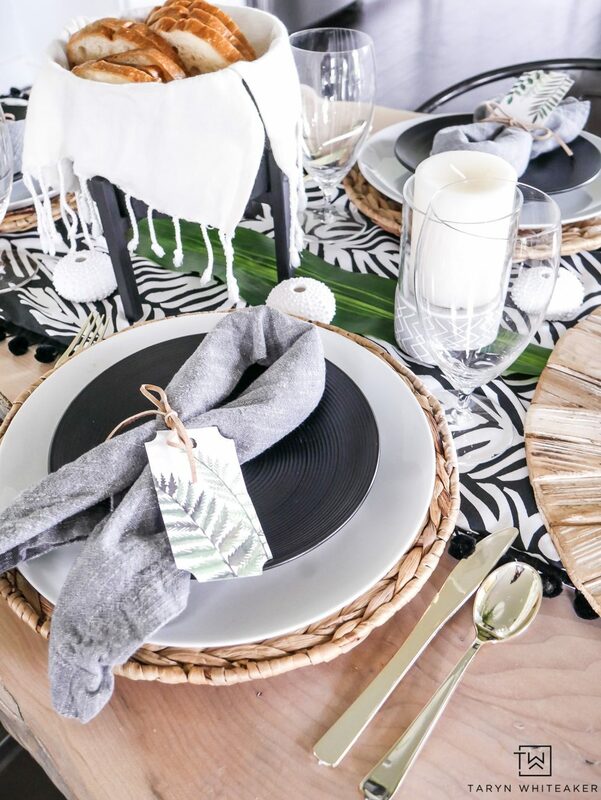 I am so excited to decorate for summer this year. The other day I headed to my local JOANN store and got a little giddy with all my fun finds from their coastal and spring collections. 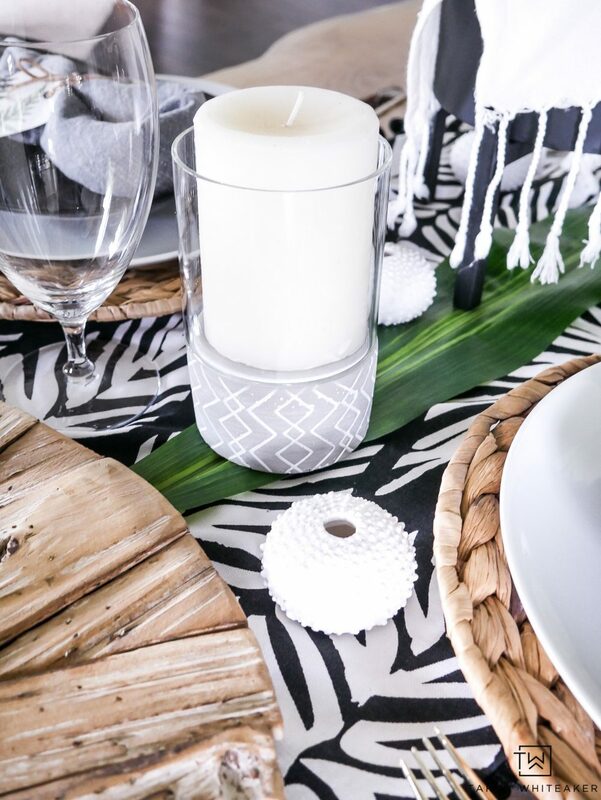 Today, I’m showing you my black and white tropical dinner party decor that’s perfect for everyday or a nice night with friends. Whenever I’m putting together a new design, whether it’s a vignette or a tablescape, I gather all my supplies first and then start playing! 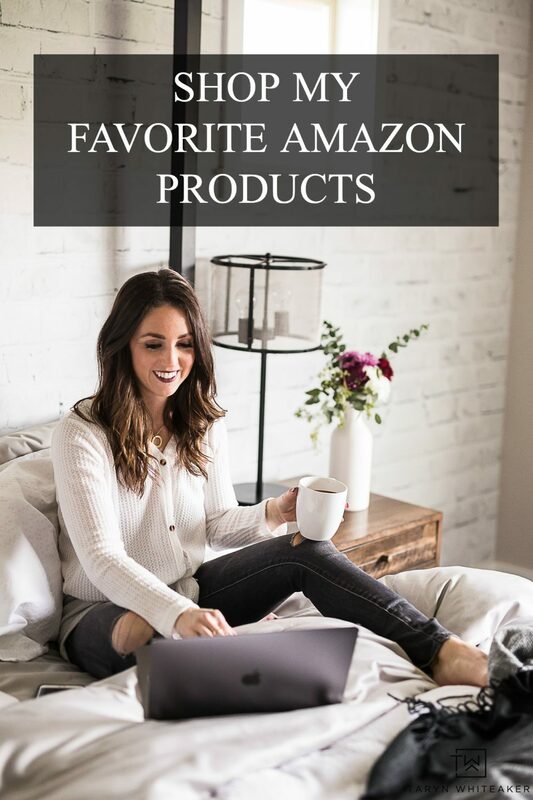 If you don’t know where to start than pick a color theme and gather all the items that fall into that. Start playing around until it feels right. And sometimes it takes time! 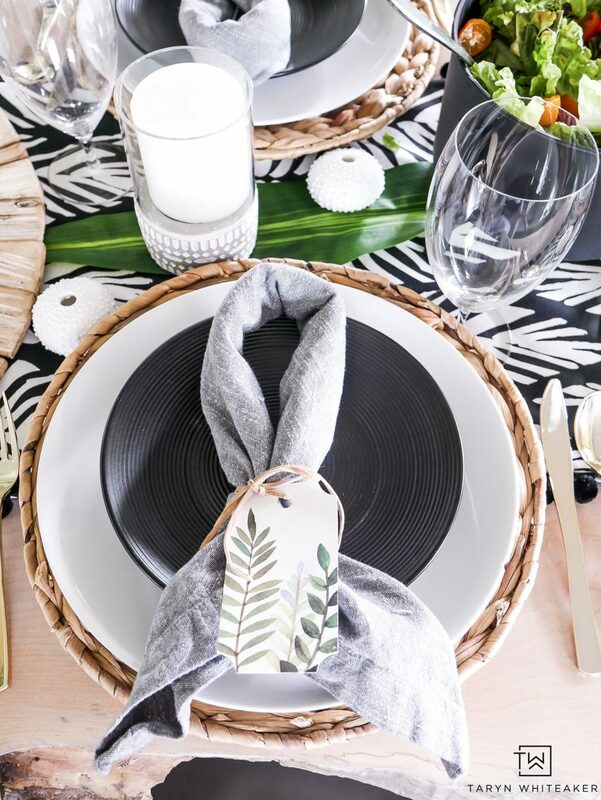 This summer table decor can be used for a casual dinner with friends or elaborated on to become a big classy coastal themed dinner party. 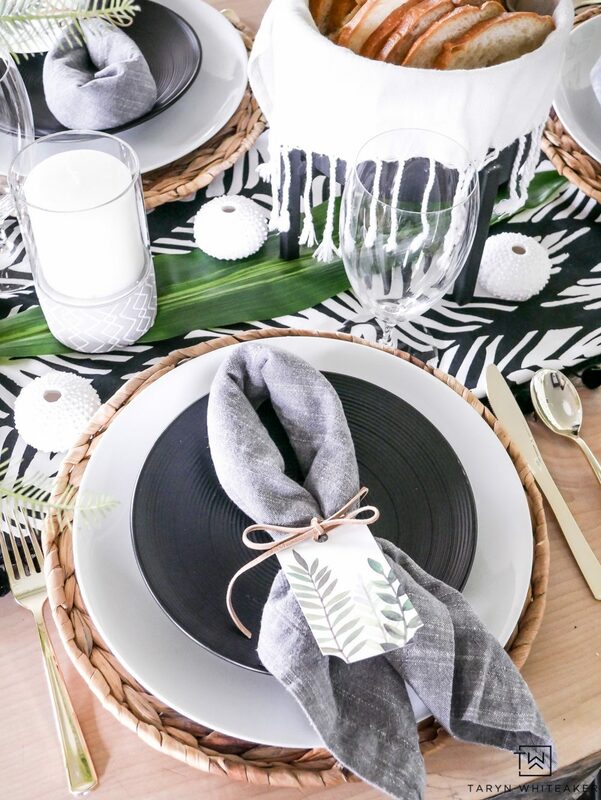 My goal for this table is also to show you how you can still use black and white table decor and still make it feel like summer with just the right touches. So let’s dive into the details. 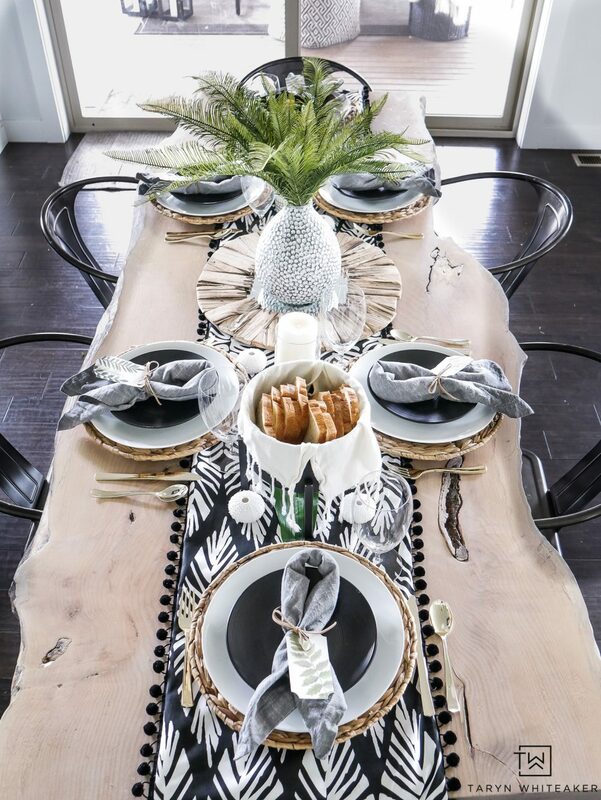 A patterned table runner is sometimes what you need to weight down your design. 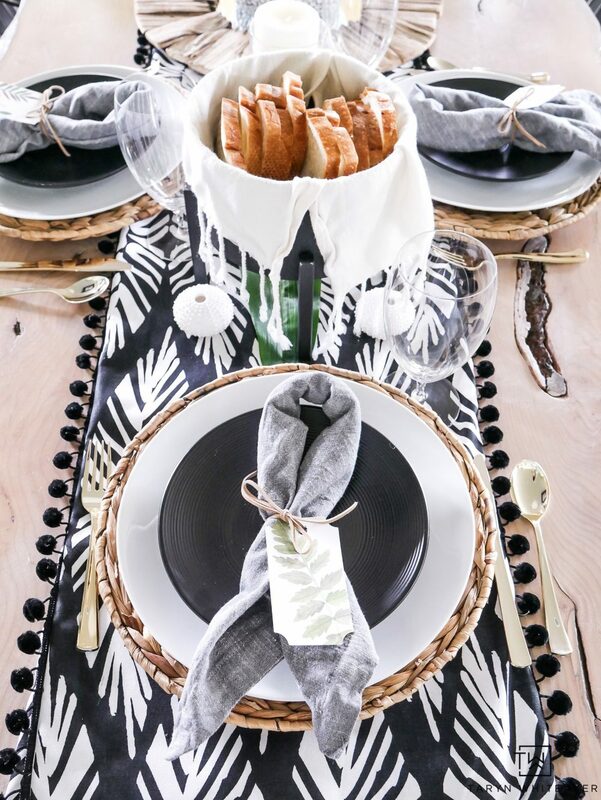 This busy black and white tropical print sets the tone for the look of the table. 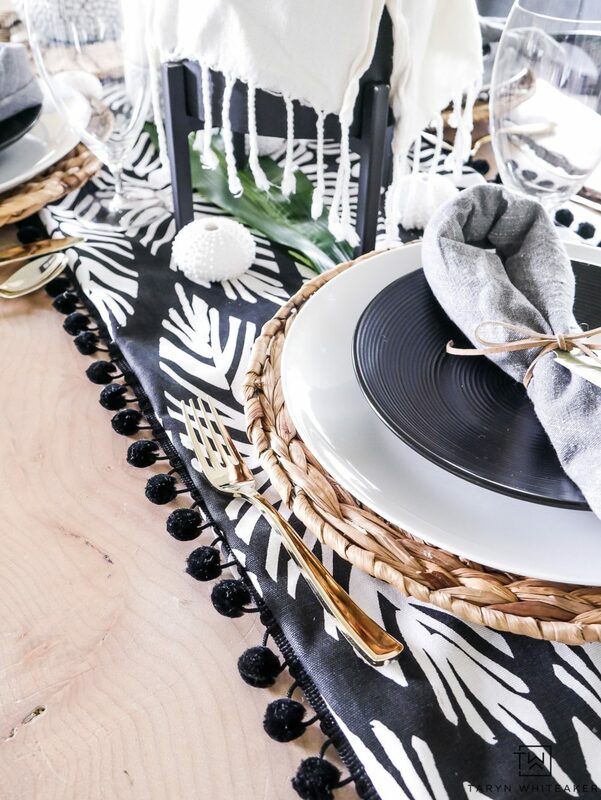 I found this Nate Berkus fabric at JOANN and I was SO excited because it is exactly what I had envisioned for the table. I turned it into this DIY table runner with little pom pom trim that’s all the rage right now. For the centerpiece I picked up tons of fun finds from JOANN. This is one of those times when it’s good to think outside of the box and see how you can use interesting pieces together. I stumbled upon this driftwood mirror and just loved the wood tone. I knew I wanted to use it in the design so I turned it into a tray for a centerpiece. 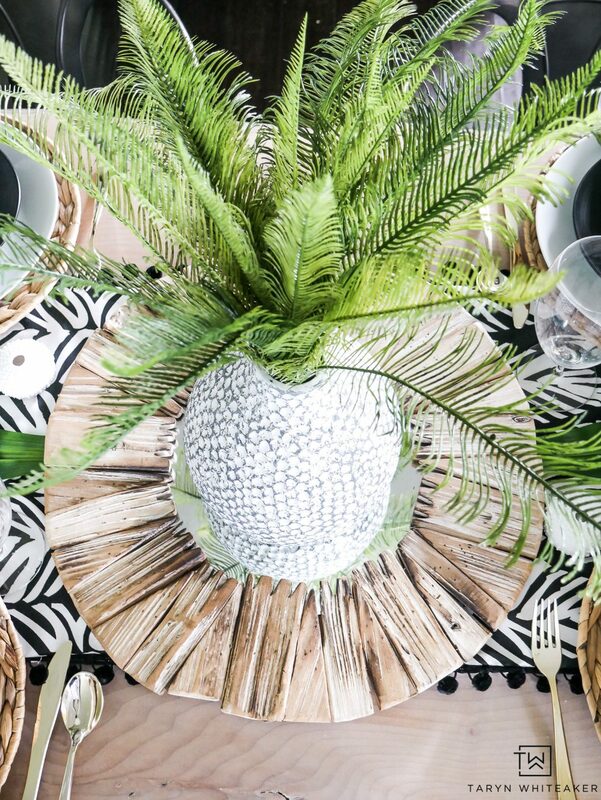 I topped it off with this hammered vase and faux greenery. 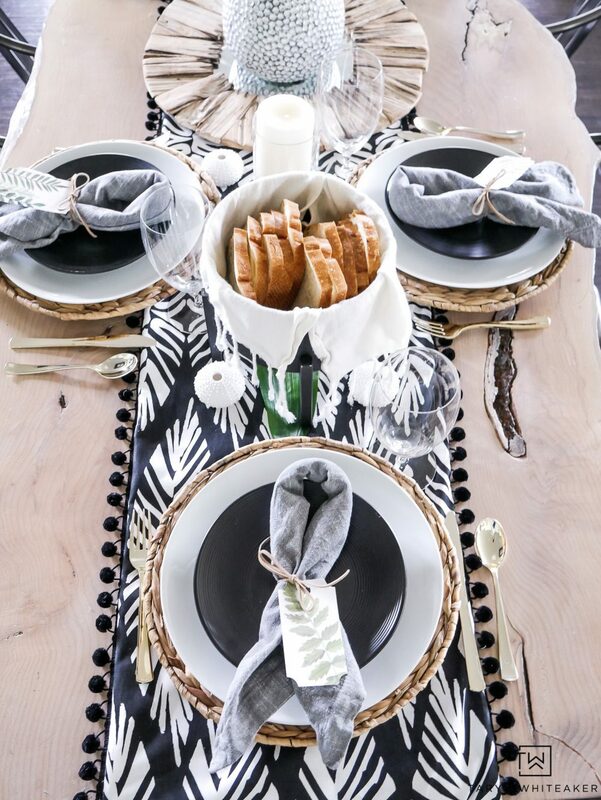 For the place settings it’s all about layering! 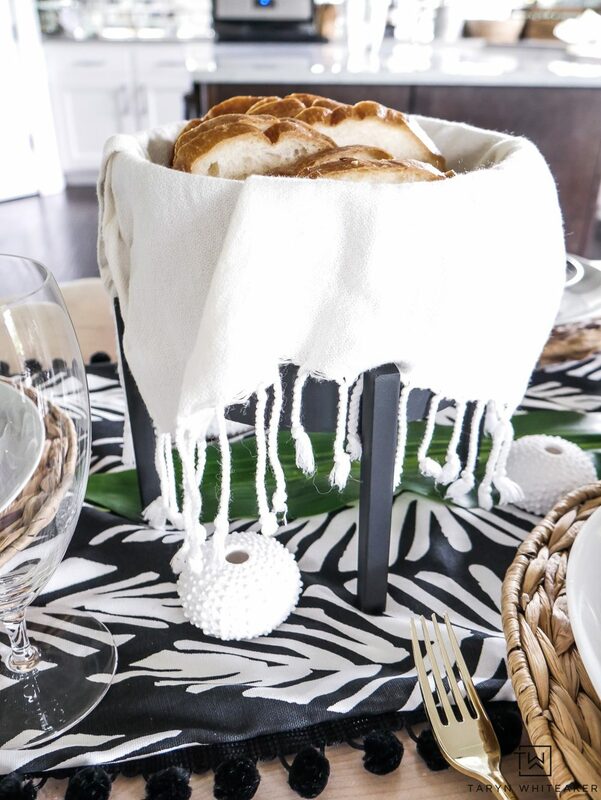 Start with texture, add a basic white plate with an accent color on top and nice napkin. For the little place setting tags, I founds these pre-made tags at JOANN and tied them together with a bit of leather ribbon. You could hand write individual names on here or on the underside. Or even a sweet little message. 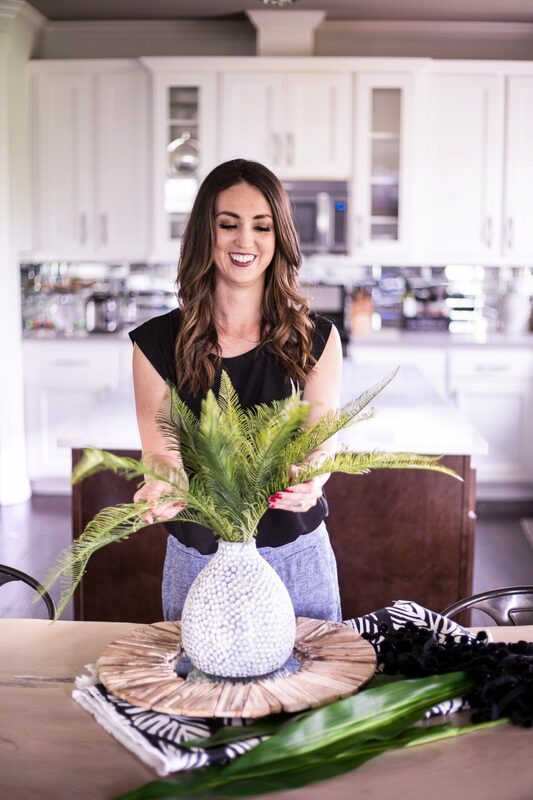 I wanted to add a little height to the table, so I picked up a few of these modern looking plant stands and turned them into baskets for food! I like how it added dimension and I can still use them as planters later on! 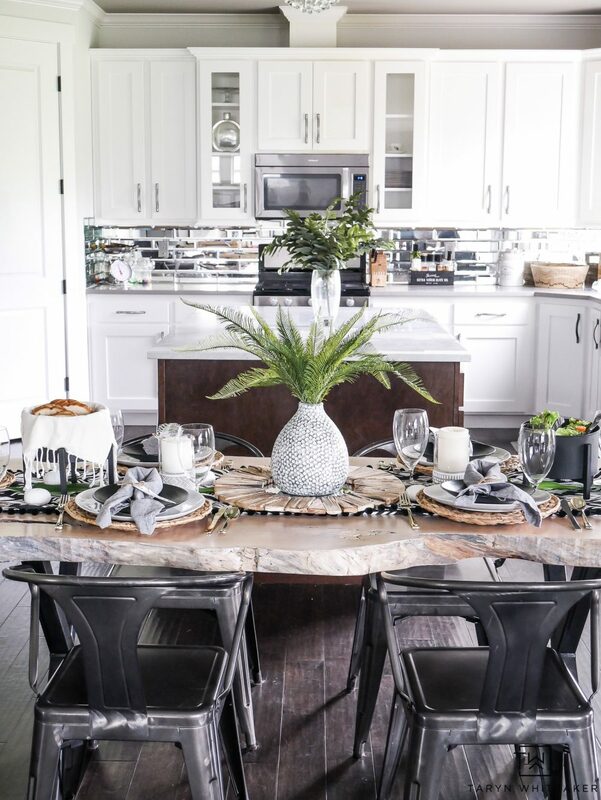 Just like decorating a full room, it’s the details that really pull the look together. I added a few of these cement candle holders, because I can never stray away from a few industrious touches! And to give it even more of a coastal feel, I added just a few of these white ceramic sea urchins throughout the table. They would also look really cute in a vase or bowl too! Wow, niceeeeeee! I love it, love it, love it. 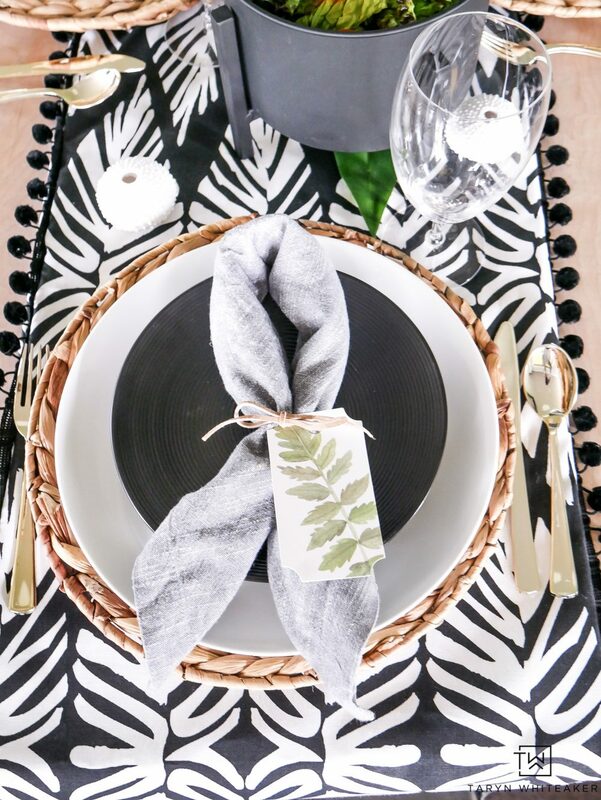 I am so excited to see the same black and white leaf fabric you used in your runner that I also purchased to make into either a table topper or several runners too. I haven’t sewed it yet. I am still in the planning stage but had intended to use bright lime green with it. You have captured the modern tropical feel perfectly. I love your use of the driftwood mirror and ferns. So very lovely. Oh! Thank you so much for sharing and thanks for the sweet comment.